I had been after a set of vintage drinking glasses for a while but not found quite the right thing (at the right price). A very thoughtful friend of mine bought me this set of rainbow stripe glasses as a small house warming gift when I moved. She always puts so much thought into her gift giving and these were just perfect for me! 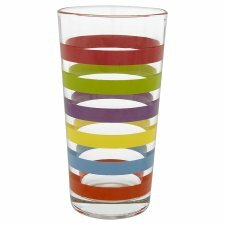 Exactly what I'd been looking for with that colourful retro look and the right size - not too big, not too small (there are a LOT of small vintage tumblers or shot glasses out there). If you want a set, UK peeps, you can still get them for a very reasonable price at Tesco. Those are wonderful...and actually very similar to a set my grandmother had back in the 1950s. I hear you on the small glasses. Though my 90 year old Grandfather still uses those tiny glasses for drinking beverages, which is adorable. These rainbow glasses are great!